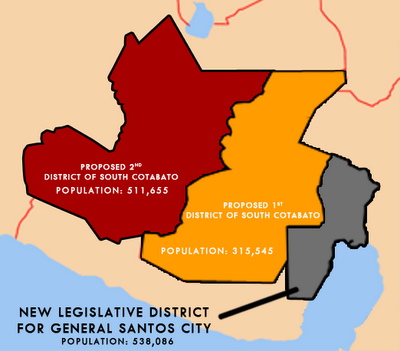 Have you heard of the reports about the proposed creation of a separate legislative district for General Santos City and the proposed reapportioning of the 1st and 2nd district of South Cotabato? 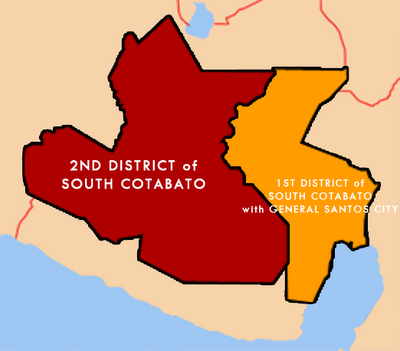 According to reports, South Cotabato legislators in the House of Representatives are pushing for the creation of a separate legislative district for General Santos City and the reapportionment of the two congressional districts of South Cotabato before the May 2013 election through House Bill 6038 which is authored by Rep. Pedro Acharon Jr. (South Cotabato & Gen. Santos City, 1st District) and co-authored by Rep. Daisy Avance-Fuentes (South Cotabato, 2nd District). House Bill 6038 filed in Congress on March 19, 2012 is an act reapportioning the composition of the first (1st) and second (2nd) legislative districts in the province of South Cotabato and thereby creating a new legislative district from such reapportionment. At present, the 1st district of South Cotabato is composed of the City of General Santos, the towns of Polomolok, Tupi and Tampakan while the 2nd district is composed of the City of Koronadal, the municipilities of Tantangan, Banga, Surallah, Lake Sebu, T'boli, Sto.Niño and Norala. Under HB 6038, a new and lone congressional district for General Santos City will be created and South Cotabato’s first district will be reshaped into the towns of Polomolok, Tupi, Tampakan and T’boli. Koronadal City and the six remaining towns will compose the province’s second district. So what do you think of House Bill 6038 and these move by our legislators in the House of Representatives? Leave your comment below.